Welcome to the Willis S. and Janet A. Strauss Performing Arts Center (SPAC). 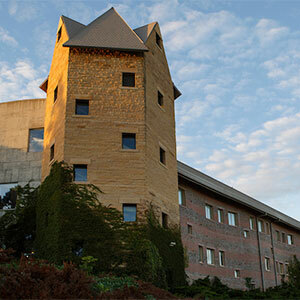 This building is next to the focal point of the campus, a campanile housing a carillon of 47 bells. The Strauss Performing Arts Center serves as the center of musical activity for the School of Music within the College of Communication, Fine Arts and Media, as well as a prime performance location in the city of Omaha. The building's main performance space is a Concert Hall that seats 422 with impressive acoustic isolation. The highlight of the Concert Hall is the Casavant Organ. This space is used for classes, rehearsals, and over 200 performances each year. In addition, there are two large rehearsal spaces with tiered seating, as well as various classrooms which are well-equipped for any class needs. The Strauss Performing Arts Center is located on University Drive North between the Criss Library and the Milo Bail Student Center, parallel to Dodge Street. 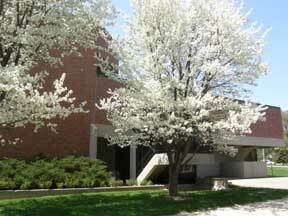 The University of Nebraska Omaha (UNO) School of Music has an active performance and event schedule. For a list of UNO School of Music events and concerts, visit our events page. The Concert Hall, rehearsal spaces, and classrooms in the Strauss Performing Arts Center are available for rental to groups within and outside the university. Reservations for outside events are available on a first-come/first-served basis, and UNO School of Music events have priority over outside events. Renters are required to complete an application and contract process, which must be approved and finalized by university administration before reservations are confirmed. In addition, UNO requires renters to provide a certificate of insurance with limits of $1,000,000 per occurrence and $3,000,000 general aggregate, naming the Board of Regents of the University of Nebraska as an “additional insured." Please contact our Operations Manager at unomusic@unomaha.edu as early as possible for rental information. Any food served in the Strauss Performing Arts Center must be ordered through UNO Catering and served and eaten in the lobby only. All events held in the Strauss Performing Arts Center must adhere to the UNO Food Policy listed below. For more information or to schedule catering for your event contact UNO Food Services at 402.554.2400 or via email unocatering@unomaha.edu. All food served on campus must be furnished by the University Food Services due to health safety concerns. Exception (s) to this policy must have the approval of the Manager of Food Services or the Director of the Student Center, or their designees. This policy relates to the entire campus with the exceptions of the Alumni Center and Student Housing. Bringing in food and beverages, from any outside source, for meetings (including potlucks) is prohibited. It is not the intent of such a policy to prohibit anyone from “brown bagging” for personal consumption. This policy prohibits the sale or give away of food items on campus.